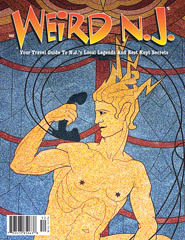 One of the most unique, and downright bizarre roadside attractions to be found in New Jersey is surprisingly not the work of some eccentric with too much spare time on his hands. It’s actually a federally funded work of public statuary entitled “Light Dispelling Darkness,” which can be found in Roosevelt Park in Edison. 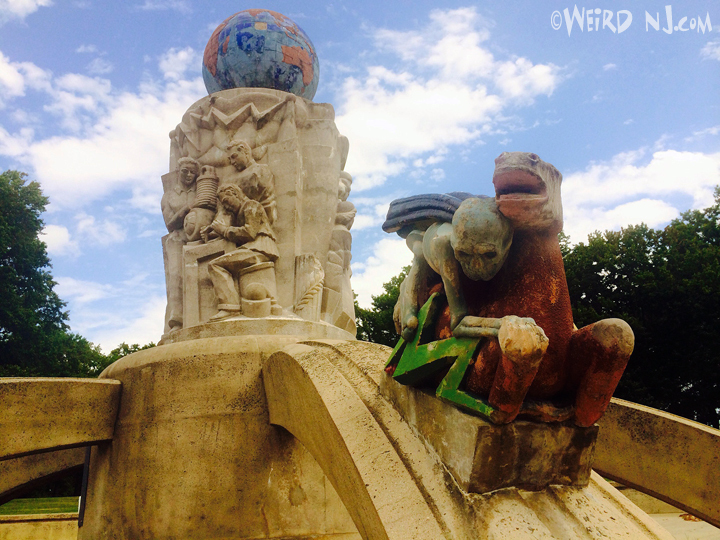 The sculpture is a fountain designed in 1937 by artist Waylande Gregory (1905 –1971), an accomplisher ceramic sculptor who gained notoriety through his commissioned works for prominent individuals such as Albert Einstein. 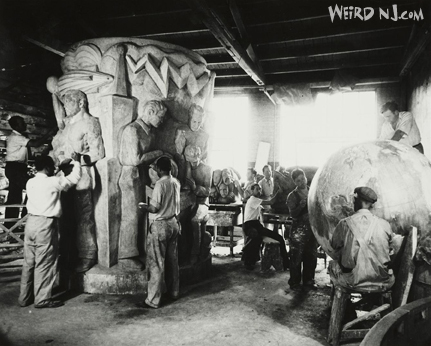 His was best known for creating some of the largest ceramic sculptures in America, including the “Fountain of the Atom” for 1939 New York World’s Fair. 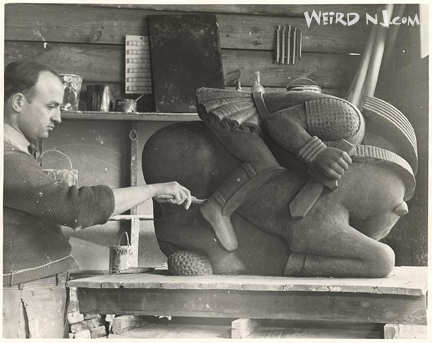 In 1933, Gregory had moved form Michigan to Metuchen, New Jersey and set up a workshop in the Atlantic Terra Cotta Company in Perth Amboy. Terra cotta was a large industry in New Jersey at the time, being produced in Woodbridge and Sayreville as well as Perth Amboy. Gregory became the head of Franklin D. Roosevelt’s W.P.A. 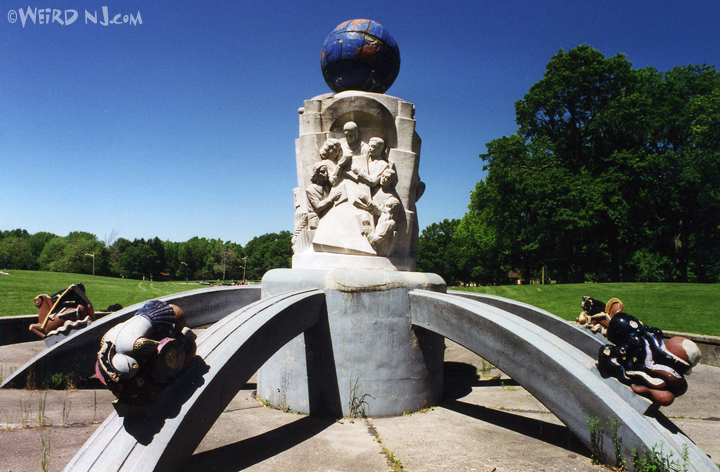 (Works Progress Administration) Sculpture Project in New Jersey and this is where he would create some of his first monumental ceramic sculptures and began work on the monumental Light Dispelling Darkness. 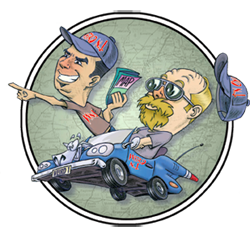 The W.P.A. was part of a federal program designed to create jobs during the Great Depression. The sculpture also honors the achievements of local inventor Thomas Edison, who triumphed over darkness with the creation of the electric light bulb. Light Dispelling Darkness exhibits a heroic theme of combating the darkness of evil through the enlightenment of knowledge. 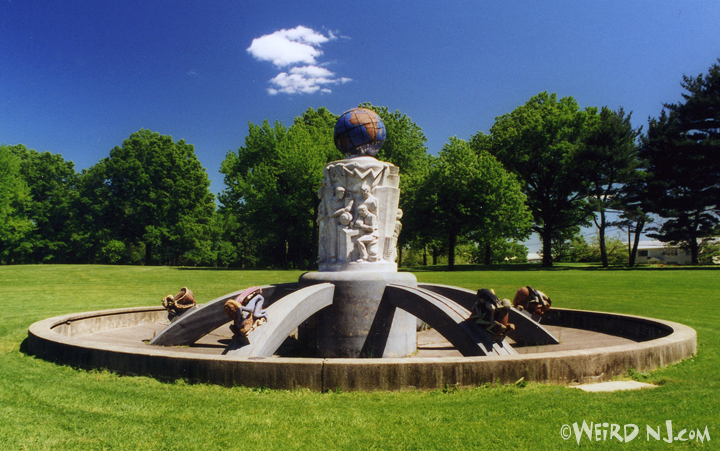 The central pillar of the fountain depicts images of education, industry, and technology in a bold deco relief style, and supports a globe of the Earth that is finished in a beautiful hand-painted glaze, rising from the center of a 40-foot diameter pool. Where the work really takes a turn toward the surreal though is on the six arched viaducts that buttress the fountain’s base. They radiate from the center pillar, each depicting the “dispelling” of one horrific looking evil of society in brilliantly glazed terra cotta sculptures. The Four Horsemen of the Apocalypse are represented, who, according to the Old Testament shall scourge the Earth prior to Judgment Day. 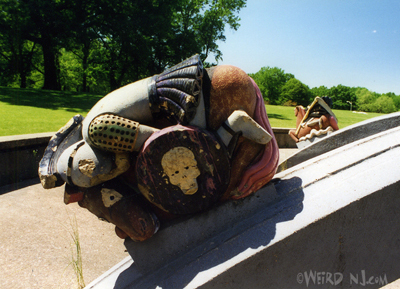 The additional two sculptures represent Greed and Materialism. War is shown as a Trojan soldier on horseback carrying a shield emblazoned with a skull and wearing a WWI gas mask. Famine, a cadaverous woman with deep sunken eyes who carries the scales of justice. Pestilence is depicted as a lustful blue character covered in festering yellow sores and riding a horse with a dollar sign on its hindquarters. Materialism is represented by a serpent-like creature, which possesses five grotesque human faces and is trailing a ribbon of Stock Market ticker tape. Greed is portrayed by two hideous, yet beautifully detailed, octopi writhing in battle with each other. Death is rendered as a scythe-wielding skeleton riding a lightning bolt. Gregory achieved critical success and reached the peak of his artistic powers in the 1930s. After 1940, he no longer created monumental ceramic sculptures, but instead focused on production porcelains for leading retail stores such as Tiffany’s, B. Altman and Company, Saks Fifth Avenue, Hammacher Schlemmer and others. He revisited Roosevelt Park later in his life in 1968, three years prior to his death, and was dismayed by the deterioration he observed of one of his greatest creations. Since the material used to form Light Dispelling Darkness was terra cotta (a fragile medium not often employed for outdoor works such as this), many of the brightly colored details of the statue had been lost to the elements or vandalism over the years. 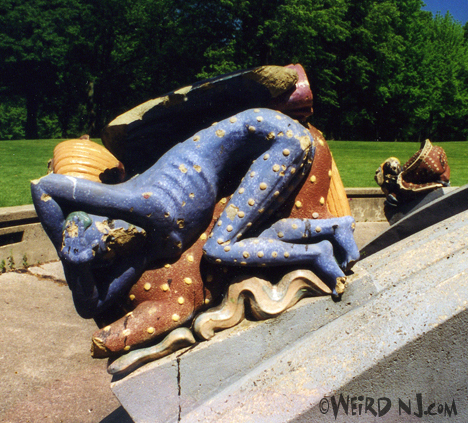 By the early 2000s parts of the once magnificent sculpture were chipped or missing altogether. A major restoration effort was undertaken in 2005 by the Middlesex County Parks Department and County Cultural and Heritage Commission, with support from the National Endowment for the Arts as part of Save Outdoor Sculpture!, a joint project of Heritage Preservation and the Smithsonian American Art Museum and Target Stores. According to a plaque posted in the park afterward, the County Engineer “coordinated the restoration efforts with a Team of Professional engineers and artists using historic photographs, models and written information from the estate of Waylande Gregory, the County followed the artist’s original water and lighting design concepts and restored the fountain to its intended glory.” This is unfortunately not completely the case, however. While it is wonderful to see the water feature once again intermittently operational, and the globe partially restored, the workmanship on the terra cotta figures leaves much to be desired. The once brilliantly glaze of sculptures has been replaced in many places by drab, poorly rendered pastel colored touch-up paint. Perhaps though, there would be no means short of removing each figure and re-glazing and re-firing it that could revive their original luminescence. In its day, with water streaming from its pedestal and cascading over its grotesquely evil cast of characters, Light Dispelling Darkness must have been quite a sight to behold. 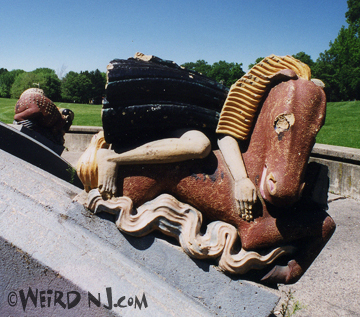 Though it may not be the glorious work that it once was, it is the only remaining outdoor sculpture from the New Jersey branch of the W.P.A. that is still in existence today. Its inspirationally optimistic view of the future, created in the depths our nation’s most desperate depression by a visionary artist, makes a powerful statement for the effect that public art can have in our daily lives. And it’s also pretty darn weird. 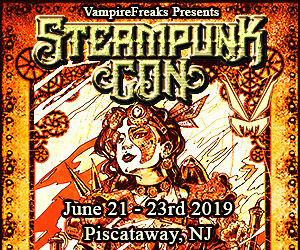 This entry was posted in Roadside Oddities, Stories and tagged death, depression, edison, famine, fountain, four horsemen, greed, gregory, light dispelling darkness, materialism, menlo park, park, pestilence, public, roosevelt, statuary, terra cotta, war, waylande, wpa. Bookmark the permalink.